With the Easter holiday looming, several releases are getting a jump on the weekend by opening on Wednesday, so BOP presents you with this early edition of the Weekend Forecast. Three wide releases are among the weekend's slate but the pick of the week just might be a film opening only in select markets. It's time once again to play Name That Pitch Meeting. "OK, so it's Rush Hour meets The Matrix. We'll get Chow Yun-Fat and that Stifler dude from American Pie to act all wisecracky and talk about all that Chosen One stuff that the kids seem to dig. And we can show a guy dodging bullets, just like Neo! It'll be like The Golden Child but hip for Gen Y!" 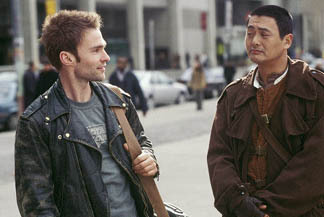 If you've guessed anything but Bulletproof Monk, you haven't been paying attention. It wears its homage to The Matrix on its sleeve, though, and Chow Yun-Fat adds a huge amount of street cred to the film. It's Yun-Fat's first film since the breakthrough 2001 success of Crouching Tiger, Hidden Dragon, and this weekend will go a long way toward telling us whether that film has firmly established him in the North American consciousness as an action star of the same stature as his Hong Kong compatriots Jackie Chan and Jet Li. His character in this film could be a modern version of his character from Crouching Tiger, but transplanted into a fish-out-of-water buddy comedy. Yun-Fat's box office record before Crouching Tiger hadn't been shining; The Replacement Killers and The Corruptor both came and went with little impact before the $100 million plus and multiple Oscar nominations that CTHD brought in. After matching up with Mira Sorvino and Mark Walhberg for two underwhelming films, will Seann William Scott prove to be the right co-star for Chow Yun-Fat? While it's hard to really consider him a box office draw, it's unlikely that anyone in Bulletproof Monk's target audience would be unfamiliar with Scott; after starring in both the massively popular American Pie movies and the infamous (and somewhat inspired) Dude, Where's My Car?, he's likely one of the best known under-30 actors today (try not to be bitter, Jake Gyllenhaal). Is he any more unlikely a Chosen One than say, Keanu Reeves? Well, marginally, but look how well that turned out. Commercials have highlighted his comedy elements as much as Yun-Fat's action, so clearly we're meant to expect half-and-half, a la the aforementioned Rush Hour. The pairing is just unusual enough to make the film a very interesting prospect for the weekend. Opening on Wednesday, Bulletproof Monk should manage about $17 million for Friday-Sunday with another $4 million in the two days prior to the weekend. This box office total should give a clear path for last weekend's first place film to repeat. Anger Management became April's new record holder for opening weekend gross and was also Adam Sandler's best start ever. With the exception of The Waterboy, none of Sandler's films have been legs darlings, though they haven't been disasters, either. He's been a model of giving his fans what they want, so there's no reason to expect Anger Management to behave much differently. With around $25 million this weekend, the film will keep the top spot and blast past the $75 million mark total. The family option for this weekend's moviegoers is Holes, based on a book that I've somehow managed never to hear of, not that that means a lot. The idea is familiar, though, a gang of outcast kids band together under unlikely circumstances to defeat a corrupt authority figure. Every generation needs its own Goonies, I suppose, and this film is certainly trying to be that. The kid leads are all no-names, though Jon Voight and Sigourney Weaver lend themselves out as the adult heavies, possibly giving some reason for adults to be there, though the film is just a bit too silly looking to get beyond the pre-teen crowd. Perhaps the surprising thing here is the director, Andrew Davis, notable as the man behind the camera for Under Siege and The Fugitive. Of course, he's also the same guy who is responsible for Chain Reaction and Collateral Damage, so there's no guarantee of quality. The trailer does manage to invoke some startling scenery (and a doozy of a closing shot), so the movie itself is probably entirely tolerable. Opening on Friday, Holes should dig in for a $14 million performance over three days. In the "Please God No" category comes the third wide release of this weekend, Malibu's Most Wanted. Sure he was funny in the Scream series, but this project, a horrific-looking "Pretty Fly For a White Guy: The Movie", has me wishing for a movie cross-over with Scream 2 to see him get killed again. I blame each and every viewer of the Jamie Kennedy Experience for creating the environment where this movie even gets considered, let alone produced and released. Sadly, I can't even guarantee that Malibu's Most Wanted will get properly ignored as it should, given the stunning triumph of Bringing Down the House through March. Let's hope that Hollywood has gotten the "white people drive like this, black people drive like this" phase out of its system. Does it matter what this film makes? Anything is too much. There's a real comedy in release this weekend, though, for those lucky enough to find it; A Mighty Wind, the latest improvised comedy from Christopher Guest, hit theaters on Wednesday in a little over 100 locations. Following up Waiting for Guffman and Best in Show, these improvs have found a niche in hilariously skewering whatever segment of society Guest has singled out for ridicule. This time folk music is the coat hanger for the film's plot, a reunion concert of folkies played by Guest, Michael McKean and Harry Shearer. This casting, of course, reunites the Spinal Tap members once again after 20 years. While taking on folk music veers a little too close to "Take that, Swanson's" territory, the cast has a tremendous track record when it comes to finding the humor in this framework. Many cast members from previous Guest comedies return; names such as Catherine O'Hara, Parker Posey and Eugene Levy, the co-writer of the film. While Waiting for Guffman stayed small, Best in Show was able to build on positive word-of-mouth and rental business and earned almost $20 million total. Look for A Mighty Wind to start out at around $2 million on its limited screens but earn the right for a steady expansion in weeks to come. In the past half a dozen or so years, black-targeted films have been very successful in small, targeted venue counts. Chasing Papi hopes to do the same for the Latino market, launching in 583 venues. A zany romantic comedy, it stars a lot of people I've never heard of but who I'm sure are very popular in some circles. With the Latino market the fastest growing in North America, Chasing Papi could very well be a benchmark film for similar future releases. I would not be surprised to see this film make in the $4-5 million range this weekend. The new films are almost the whole show as we reach the midway point of April; the rest of the top ten will see a bit of spring cleaning going on with several films that last weekend earned in the $3 - $7 million range being swept out the back.